Batya Friedman: Hi, my name Batya Friedman, I am a professor at the University of Washington. I’m here interviewing Chief Taku. It is November 3rd, 2008 and with me is Professor Ron Slye from Seattle University Law School and Max Andrews who’s our cinematographer. So, Chief Taku, can I ask you to please introduce yourself? Say your name, your role here at the ICTR and your nationality. Well, as you’ve rightly said, my name is Chief Charles Taku. I’m Lead Counsel in the Military 2, 2 trial. I first came here in 1999 as Lead Counsel for Laurent Semanza. I’m also Lead Counsel in the Special Court for Sierra Leone in the, the case of Prosecutor versus the Revolutionary United Front for Sierra Leone. I’m Lead Counsel for Mr. Morris Kallon. And I’m Lead Counsel here in the Military 2 trial as I’ve just said. I come from Cameroon. BF: So can you tell us a little bit about your role as, as Lead Counsel? When you say Lead Counsel, you mean Lead Counsel for the defense? Yes, I’m Lead Counsel for the defense. I first came here on the 23rd of October 1989 as co-counsel on the case of Prosecutor versus Laurent Semanza. And a few months after, I became Lead Counsel and I’ve been Le-, Lead counsel all along. 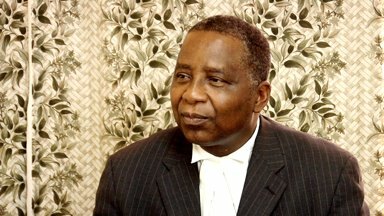 The case of Semanza ended in sometimes in 2004, and I was appointed Lead Counsel in 2005 at the Revolutionar-, for the Revolutionary United Front for Sierra Leone. That’s for Major Mo-, Morris Kallon. And two months after I was appointed here again as Lead Counsel in Military 2, as Lead Counsel for Major François Xavier Nzuwonemeye who was the commander of the Reconnaissance Battalion of the Rwandan army. And I work as Lead Counsel and actually coordinator for a legal team constituted by the, the tribunal to defend the accused persons. And I have under me co-counsel and I have a number of legal assistants and investigators. And Lead Counsel, I direct the team, the defense team as it were. And now Beth Lyons, whom you know, became co-counsel about more than a year ago. I met her here on a visit from the US and when I was doing Semanza, she was sitting in the gallery. And when she went back she sent a card to me and I found that very, very touching because many (_______) thousand who come and nobody does that. And I said this must be a very good lawyer so I invited her to come back here and join the team. Unfortunate for me, when she came, my former co-counsel Alao, Barrister Alao, he’s from Benin Republic, he had become a Lead Counsel for Colonel Aloys Simba. So he was fast, faster than me and he got her as co-counsel in that team. And when the, the case ended, I was happy enough to bring her back to come and work with me. So, as I say, Lead Counsel’s the one who coordinates the entire defense of an accused person and that’s the role I play either here or in Sierra Leone. BF: Mm-hmm. So, I’d like to take you back to the spring of 1994. BF: And, so in 1994 in the spring, where were you and what were you doing at that time? Well, about that time I was in Cameroon. I, I followed the story like every other person, about what was happening in Rwanda unfortunately. Of particular interest to me was the fact that the elements that led, the factors or the elements that led to the, the calamity in Rwanda are present in many African countries, including my own country. The conduct of the politicians, excruciating poverty, economic factors, and of course the duplicity of international community in situations like these. So I followed the events and I followed the events painfully as I watch over the television or listened to the news. There was nobody there to do anything to, to help these people of Rwanda to solve this problem. And most striking of all was the fact that United Nations was actually there on the spot. And what came to my mind was what use is the United Nations? What use is United Nations that even their presence cannot pre-empt a calamity of that nature? So I was in Cameroon but later (_________) that I would play a role in the, one way or other at some point in time. BF: So, and what were you doing in Cameroon at, at that time, in your country? Well, in Cameroon at the time, we, we were facing a serious crisis at the time because I come from the English-speaking part of Cameroon. And these were two Trust Territories who were under the British and the, the French majority were under the French. And were, as Trust Territories, that the UN had a mandate to lead to independence. It was never foreseen in the UN charter that, well, it could lead to what at the time we thought was annexation – that instead of leading our own part of the country to independence, because we're a former German colony and a Trust Territory of Great Britain, the, the (______) brought us into what we considered as some form of annexation in that our own party was just annexed to the French Cameroons. And the people, population was agitating at that time. Thousands of people were agitating that they want independence, not (_____) independence. The, the policies of the, the, the majority in power, the French majority in power, were very oppressive. And, at that time I had been on the bar council, (_____________) of the bar council and also one of the perhaps very visible lawyers at the time because a lot of people were arrested, many of them died in detention. And at least in ‘92 people were brought before the military court and they were being indicted before the military court, civilians of course, for treason. That carries mandatory death sentence under the Cameroonian military court. And I was Lead Counsel defending these, these, these people. The case was going on around the time that this was ha-, was happening and we just thought that oh, maybe this crackdown may lead to some other serious crisis. At that time we need also not just to defend the courtroom but to get international support, because we thought that the, the military people were not people who can do justice to civilians, especially as there was no reason to bring them to military court in the first place. These were civilians; they were not armed. There was, there was no reason to bring them there. More importantly but because they were arrested from the English-speaking part of Cameroon and carried over to the French-speaking part to be subjected under different legal system and to be tried in a language they didn’t understand. And we were busy trying to rally international support, the embassies in Yaoundé. And at some point in time I left and went to Washington and thought that we could, the press in Washington could help us. I went to the Voice of America. Scott Steel was still a very young reporter at the time preparing at the time to come to the Great Lakes. So, he was asked to interview me and I was there with him in the program "English to Africa" for over a week highlighting the, the problems with this trial, that the, the fair trial issues. And of course he did a very effective job. At the end, when we came back, this, the Voice of America actually helped us in really propagating, I mean, our own side of the story, because back home the media is controlled by the government, so nobody could have known that whole story. When I came back now, almost, most of the people were acquitted but a few of them (__), some 20 years, some 15 years, I think one or two life here. And for us in, under the circumstances, it was a victory – thanks to the Voice of America, thanks to the international community because the US Embassy in Yaoundé also they were very interested in the case. They came to me at every turn and they were in court at every session of the trial. So these, these two events were going on simultaneously with what was happening in Rwanda. And the, the – we were telling the journalists at Voice of America, was telling the Cameroonian government, “Let there not be another Rwanda. This is leading to another Rwanda; this is leading to genocide,” and so on and so forth. And therefore you will be surprised that it is my performance on that case that cleared the role in me being called upon, shortly thereafter, to come and defend here.